Ukiyo-e (浮世絵), "pictures of the floating world," is a genre of Japanese woodblock prints and paintings produced between the seventeenth and twentieth centuries, depicting landscapes, the theater and scenes from the entertainment districts of Japanese cities. Ukiyo-e were often used for illustrations in picture books and guide books, but came into their own as single-sheet prints (postcards or kakemono-e), and as posters for the kabuki theater. They were widely available, and provide a fascinating glimpse into the everyday life of earlier times. During the late 1800s, the prints were exported to Europe, especially to Paris, where they became an inspiration for cubism and many impressionist painters, such as Vincent van Gogh, Claude Monet, Edgar Degas, and Gustav Klimt. This movement was called Japonism. Today the prints are often reproduced on calendars, postcards and greeting cards. Ukiyo, meaning "floating world," refers to the lively and colorful culture that bloomed in the urban centers of Edo (modern-day Tokyo), Osaka, and Kyoto, which were worlds unto themselves. “Ukiyo” is an ironic allusion to the homophone "Sorrowful World" (憂き世), the earthly plane of death and rebirth from which Buddhists sought release. Ukiyo-e can be categorized into the Edo period, which comprises ukiyo-e from its origins until about 1867, and the Meiji period from 1867 until 1912. The Edo period was an era of political of calm and provided an ideal environment for the development of the art in a commercial form; while the Meiji period was characterized by new influences as Japan opened up to the West. The roots of ukiyo-e can be traced to the urbanization that took place in late-sixteenth-century Japan. This led to the development of a class of merchants and artisans who began writing stories and novels, and painting pictures, compiled together in ehon (絵本, picture books, books with stories and picture illustrations), such as the 1608 edition of Tales of Ise (Ise-monogatari) by Hon'ami Kōetsu. Ukiyo-e is thought to have originated with the polychromatic paintings of Hishikawa Moronobu, in the 1670s. The first prints were made using only India ink; later some prints were manually colored using a brush. The art form rose to great popularity in the metropolitan culture of Edo (Tokyo) during the second half of the seventeenth century. Ukiyo-e were often used as illustrations in picture books, but came into their own as single-sheet prints (postcards or kakemono-e), and as posters for the kabuki theater. Initially, themes were drawn from Chinese tales and works of art. Later illustrations depicted urban life and culture; scenic prints, postcards and guidebooks were also popular. All were commercial in nature and were widely available to the general public. In the mid-eighteenth century, Suzuki Harunobu developed the technique of polychrome printing which enabled the production of full-color prints, called nishiki-e. Most of the ukiyo-e reproduced today on postcards and calendars date from this time onward. 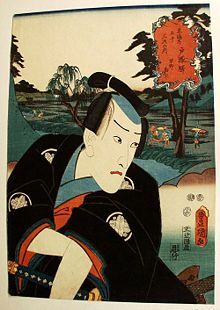 Utamaro, Hokusai, Hiroshige, and Sharaku were the prominent artists of the Edo period. They borrowed ideas from European landscape art, such as the use of receding perspective, and combined them with traditional Japanese and Chinese techniques to create an exciting new art form. Katsushika Hokusai's pictures depicted mostly landscapes and nature. 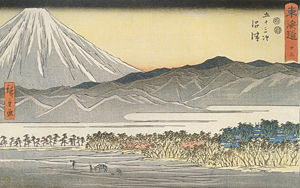 His Thirty-Six Views of Mount Fuji (富嶽三十六景, Fugaku sanjurokkei) were published starting around 1831. Ando Hiroshige and Kunisada also published many pictures featuring motifs drawn from nature. In 1842, and as part of the Tenpo reforms, pictures of courtesans, geisha and actors (onnagata) were temporarily banned. During the Kaei era (1848–1854), many foreign merchant ships visited Japan, and the ukiyo-e of that time reflect the exposure to Western culture. Following the Meiji Restoration in 1868, Japan began to import photography and printing techniques from the West. The natural plant colors used in ukiyo-e were replaced by chemical aniline dyes imported from Germany. Ukiyo-e, largely replaced by photography, went out of fashion in Japan during the bunmei-kaika (文明開化, Japan's Westernization movement during the early Meiji period). In the twentieth century, during the Taishō and Shōwa periods, ukiyo-e experienced a revival in the shin hanga and sōsaku hanga movements, both aiming to differentiate themselves from the tradition of commercial mass art. Ironically, shin hanga (new prints) was driven largely by exports to the United States. Inspired by European impressionism, the artists incorporated Western elements such as the effects of light and the expression of individual moods, but focused on strictly traditional themes. The major publisher was Watanabe Shozaburo, who is credited with creating the movement. Important artists included Shinsui Ito and Kawase Hasui, who were named Living National Treasures by the Japanese government. The less well known sōsaku hanga (creative prints) movement followed a Western concept of what art should be, the product of the creativity of the artists, emphasizing creativity over artisanship. Traditionally the processes of making ukiyo-e, the design, the carving, the printing and the publishing, were separated and done by different and highly specialized people; sōsaku hanga advocated that the artist should be involved in all stages of production. The movement was formally established with the formation of the Japanese Creative Print Society in 1918; commercially it was less successful because Western collectors preferred the more traditionally Japanese look of shin hanga. Ukiyo-e are still produced today and have influenced many areas of commercial art, such as manga (comic books) and anime (animated cartoons). Ukiyo-e prints reached Europe in the mid-nineteenth century and enjoyed particular acclaim in France. They became a source of inspiration for cubism and for many impressionist painters, such as Vincent van Gogh, Claude Monet, Edgar Degas, Henri de Toulouse-Lautrec and Gustav Klimt. This movement was called Japonism. Especially influential were the works of Katsshika Hokusai and of Kitagawa Utamaro, with his use of partial views and emphasis on light and shade. The works of Katsushika Hokusai are possibly more appreciated in Western culture than in Japan. Perhaps his most recognized work is the woodblock "In the Hollow of a Wave Off the Coast at Kanagawa." The scene is of a great wave about to devour men and boats, with the distant Mount Fuji minimized by the size of the wave. It is said to be a snapshot of a day of labor; one can see surprised men on barges, carrying fish. The waves in this work are sometimes mistakenly referred to as tsunami (津波), but they are more accurately called okinami (沖波), great off-shore waves. In 1999, Hokusai was the only Japanese to be included on Life magazine’s list of the one hundred most important achievers of the millennium. The artist produced a master drawing in ink. Craftsmen glued this drawing, face-down to a block of wood, cutting away the areas where the paper was white, thus leaving the drawing, in reverse, as a relief print on the block, but destroying the drawing. This block was inked and printed, making near-exact copies of the original drawing. These prints were in turn glued, face-down, to blocks and those areas of the design which were to be printed in a particular color were left in relief. Each of these blocks printed at least one color in the final design. The resulting woodblocks were inked in different colors and sequentially impressed onto paper. The final print bore the impressions of each of the blocks, some printed more than once to obtain just the right depth of color. Many prints could be made from ukiyo-e woodcuts or woodblocks. Ukiyo-e were originally created for commercial use by ordinary people, much like modern day posters, pin-up photos of celebrities, picture books and flyers which are eventually thrown away. Since they depicted scenes from contemporary life, they provide a valuable insight into the everyday lives of ordinary people during the Edo and Meiji ages. The subject matter of ukiyo-e is often depicted in a bold, simplistic manner which arrests the eye and appeals to even the simplest tastes. 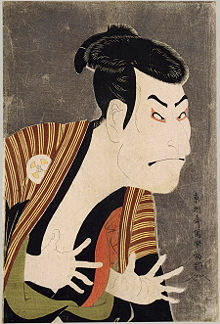 Many ukiyo-e have an element of humor or whimsy, expressed through caricature and numerous small details such as the facial expressions and situations of the people in the picture. However, the sophisticated composition and use of color, pattern and perspective delight the senses of an artist. Though they knew the ukiyo-e were destined to be discarded, Katsushika Hokusai, Kitagawa Utamaro and other excellent printmakers and painters were very particular about the artistic quality of their work. Special features of ukiyo-e are clear design, bold compositional arrangement and the use of flat, unshaded areas of color. Perspective is introduced by placing a large subject in the foreground and reducing the size of scenery or objects in the background, or by simplifying the subject in the foreground and filling the background with intricate patterns which are less easily distinguishable to the eye. An example of opposite perspective is Hokusai’s “Ryoshi” (The Fisherman), which portrays a very detailed subject in the foreground with only a light wash of color behind him. Sample ukiyo-e are available on pages of individual artists. All links retrieved January 5, 2016. This page was last modified on 5 January 2016, at 17:14.